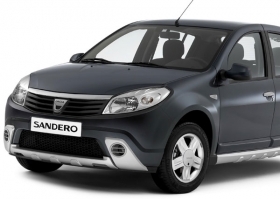 Production of the Dacia Sandero was up nearly 600% to 11,986 units in December. MUNICH -- European auto production increased an estimated 33.7 percent in December to 1,120,091, according to J.D. Power Automotive Forecasting. The gain is due to a combination of government-funded scrapping incentives, which have boosted auto demand in Europe's major markets, and the comparison with a very bad December 2008, when car sales in Europe started to fall steeply because of the global economic downturn. In December 2008, production fell to 837,819 from 1,305,649 in December 2007, a decline of 35.8 percent, J.D. Power figures show. Huge output gains for the Dacia Logan and Sandero boosted the low-cost carmaker's production 487 percent to 26,851 units. Meanwhile, Opel/Vauxhall, Chevrolet, Saab and Honda each had a production decline of 19 percent or more in the final month of 2009. Through 12 months, overall output was down 17.7 percent to 15,251,224 units in western and eastern Europe including Russia and Turkey. The only brands to increase production last year compared with 2008 were Renault, Dacia, Jaguar and Land Rover, which had the largest increase -- up 20.6 percent to 107,910 units.